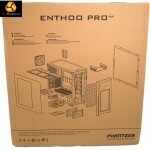 Phanteks has released a budget PC case with a model code that suggests it is a junior version of the Enthoo Pro. 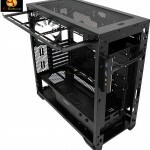 In fact the Pro M (M for mid-tower) is a hybrid of the Pro and the recent Enthoo ATX, with a number of changes to keep the price as low as possible. 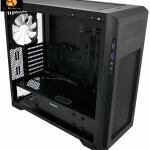 The best thing is to consider the Pro-M as the frame of the £140 Evolv ATX minus that expensive cladding. 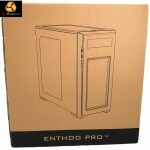 Instead you get a plastic front panel and fairly basic steel side panels that are reminiscent of the Enthoo Pro. 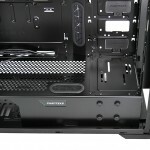 Removing the aluminium would obviously save on the bill of materials but Phanteks wanted to go further so they have pretty much removed the accessories. 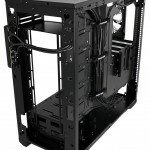 You get a single 140mm fan at the rear of the case and the bare minimum of drive bays which raises the obvious question of whether Phanteks has made sensible cuts or gone bonkers to get the price as low as possible. 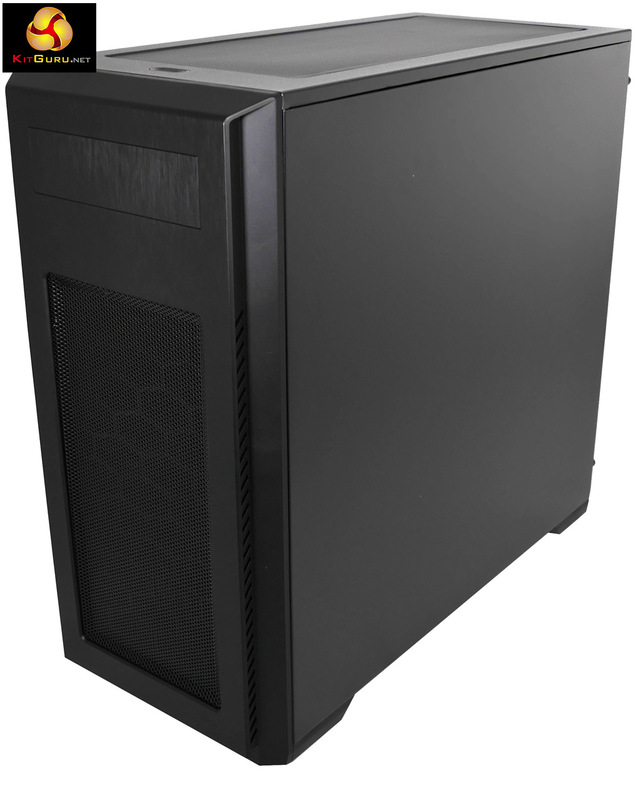 We have told to expect the Pro-M will be priced at £59.99 which sounds very competitive for an enthusiast case and puts the Pro-M head-to-head with the NZXT S340. At Computex we saw the Pro-M in Titanium Green which looked drop dead gorgeous. Tragically our review sample came in Brushed Black which looks better than a plastic panel with a mock aluminium finish has any right to look. In any other context we would congratulate Phanteks on the look of the Pro-M but this time we’re going to say ‘Titanium Green’ and pull a disappointed face. 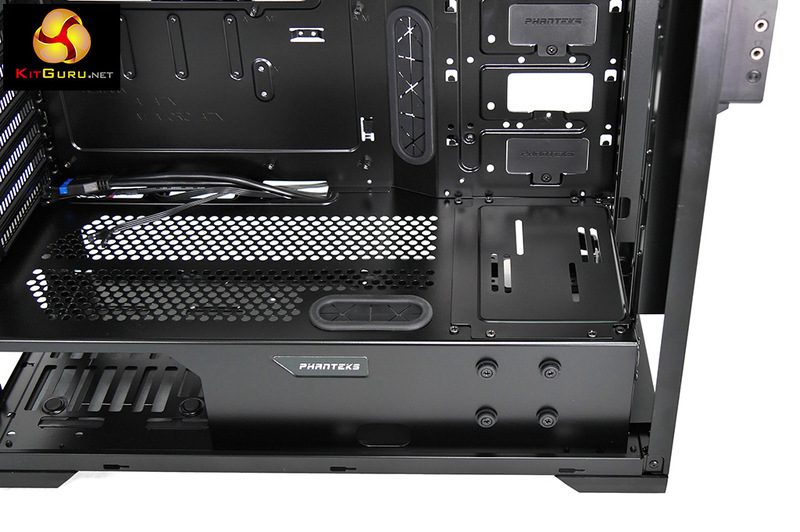 The side panels of the Pro-M are plain steel without any sound deadening material and the window in the main panel is smaller than other windows we have seen from Phanteks. Cosmetically it does a decent job but there is no attempt to deliver a Wow factor. Indeed the appearance of the Pro-M reinforces the budget nature of this case. 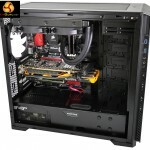 Motherboard support: E-ATX (up to 264mm wide), ATX, Micro-ATX, Mini-ITX. Included fans: 1x 140mm rear exhaust. 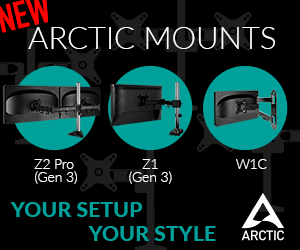 Fan mounts: 3x 120mm or 2x 140mm front, 3x 120mm or 2x 140mm roof, 1x 120mm/140mm rear. Internal drive bays: 7x 2.5”/3.5 (two supplied) 3x 2.5″ (one supplied). Dimensions: 480mm high x 235mm wide x 500mm deep. 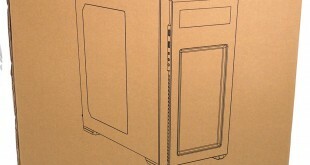 Remove the side panels and pull off the front panel and you’ll be able to see most of the features with a single glance. 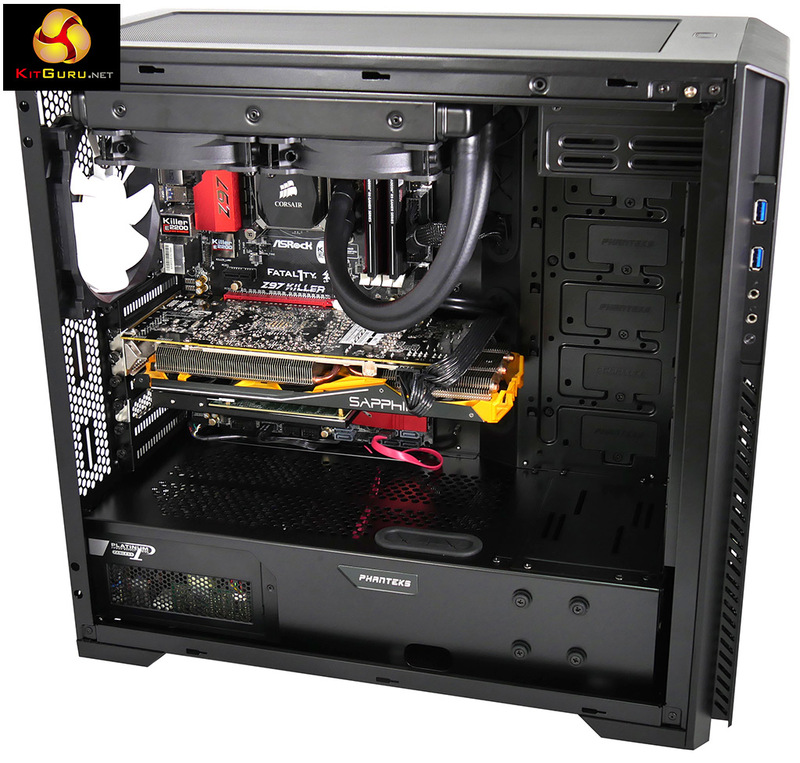 There is one optical drive bay which can be removed to open up more cooling space at the front and top of the case. 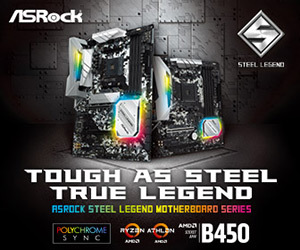 There are three positions to mount the single Drop n’ Lock SSD bay but if you want a second or third bay you’ll have to lay out some cash on accessories. Similarly there are two 2.5”/3.5 drive caddies in the lower compartment in front of the power supply, but if you want to mount more drives using the modular Enthoo ATX system you’ll have to buy the necessary drive bays. That is pretty much the essence of the Pro-M. If you need to buy a fan to replace the ‘missing’ front fan or you want extra drive bays then you are missing out on part of the appeal of the Pro-M as this will inevitably raise the cost. 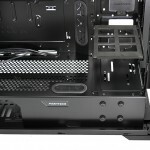 On the other hand the Pro-M has some tricks up its sleeve that have been borrowed from the Evolv ATX. Remove the lower drive bays, open the hatch in the power supply cover and remove the optical drive bay and your options for cooling are almost limitless. 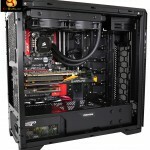 You have room for a colossal custom loop or two all-in-one coolers or pretty much any hardware you fancy installing. 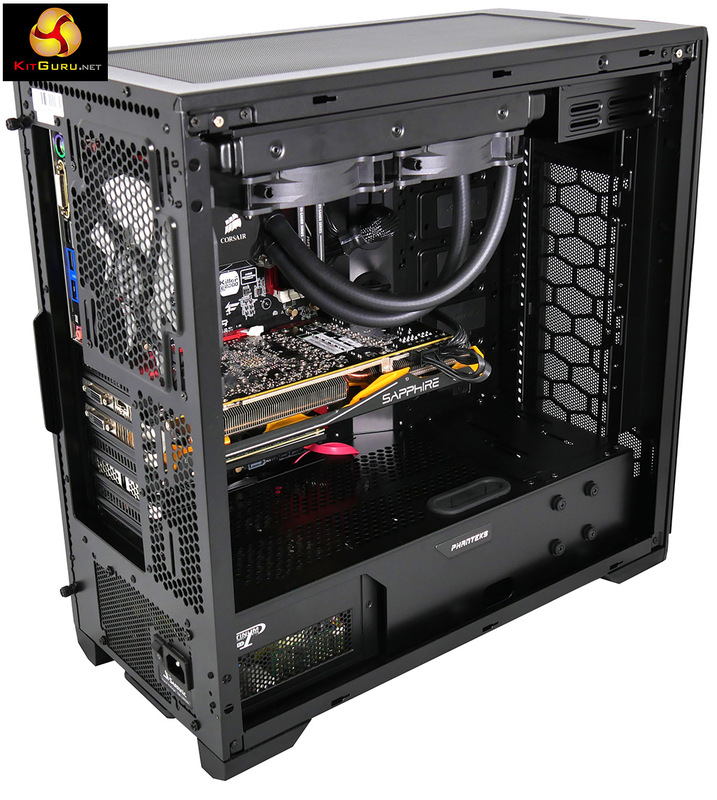 To put this case through its cooling paces we will be using a test system consisting of an Intel Core i7-4770K, Sapphire Radeon R9 290 and multiple storage drives. 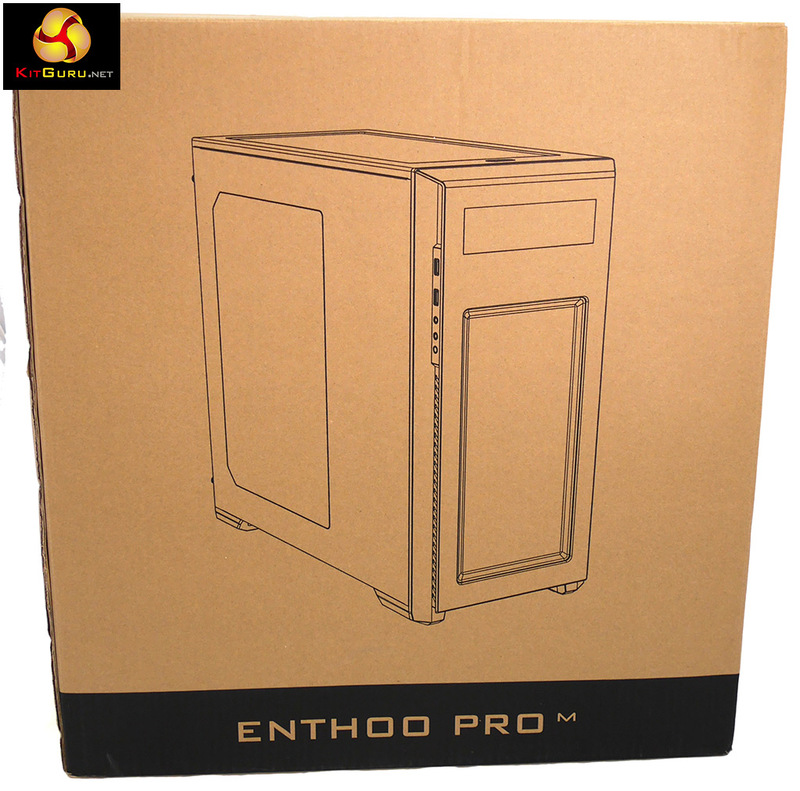 This system allows us to produce a substantial amount of heat and effectively test the Phanteks Enthoo Pro M‘s cooling capabilities. For stress testing we use a mixture of Prime95 and FurMark to create the maximum heat output. Prime95′s ‘Small FFTs’ setting allows us to stress our CPU. 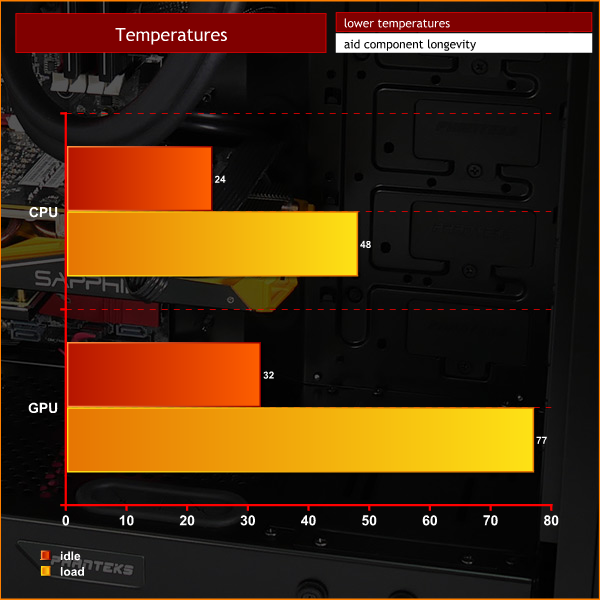 FurMark’s ‘GPU Burn-in’ mode creates the maximum amount of load our GPU is ever likely to see. Cooling in the Pro-M is good. The Pro-M has a power supply cover however it is perforated and doesn’t prevent heat rising from your PSU and heating the motherboard compartment. The open nature of the case with free flow from the filter at the front straight through to the 140mm fan at the rear is impeccable. 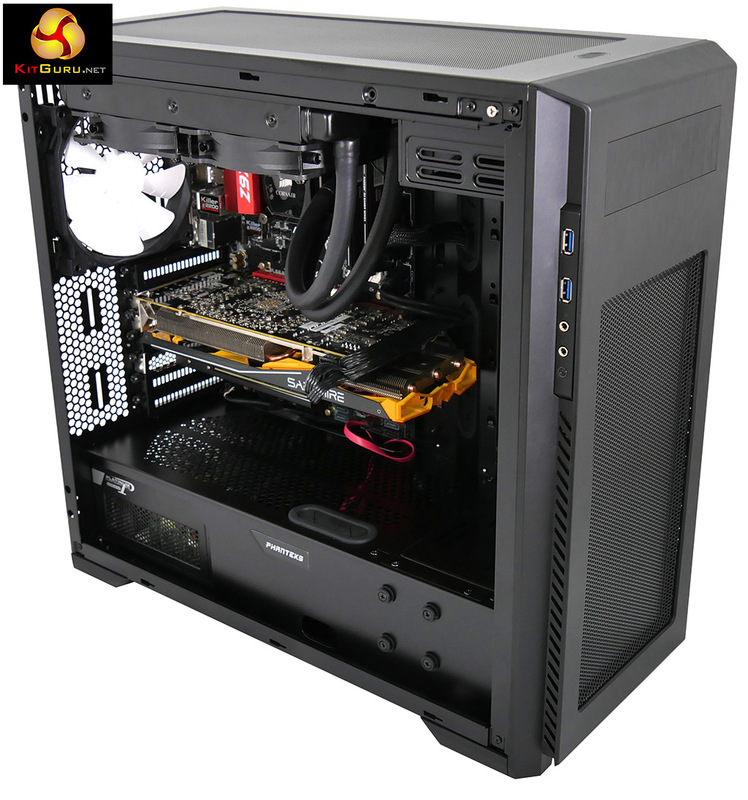 Add in a liquid cooler at the top and the air has no problem flowing and exiting. We placed our Digital Sound Level Meter one metre away from the case. 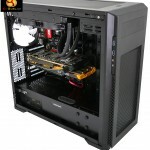 The case fans are set to maximum speed. The CPU cooler’s fans are deactivated. 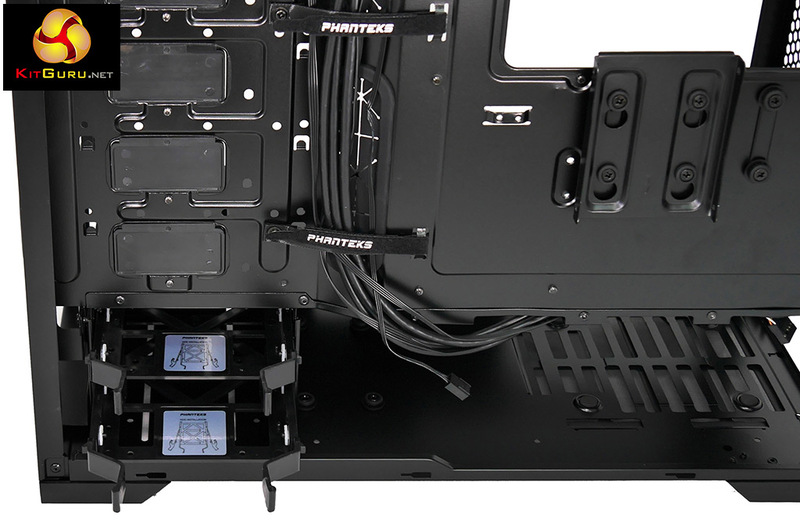 The Phanteks Enthoo Pro M’s default fan configuration is: 1x 140mm rear exhaust fans. 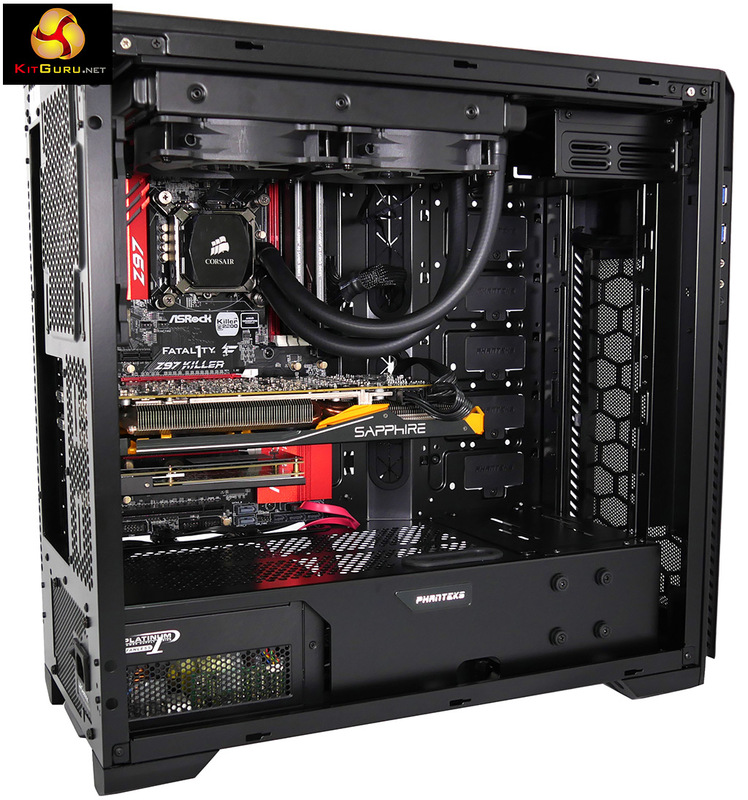 At the most basic level the Pro-M is effectively silent as the 140mm fan is very quiet. 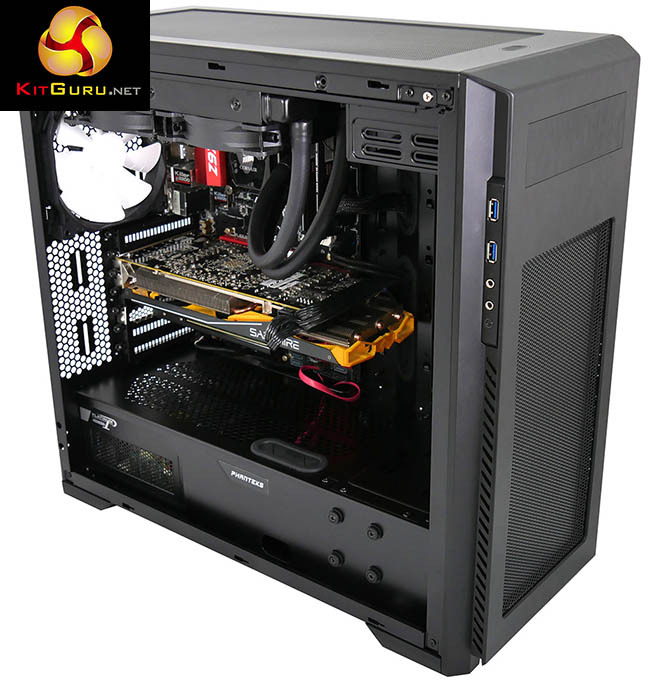 Choose your CPU cooler carefully, as we did with the Corsair H100i and you end up with a very quiet PC. 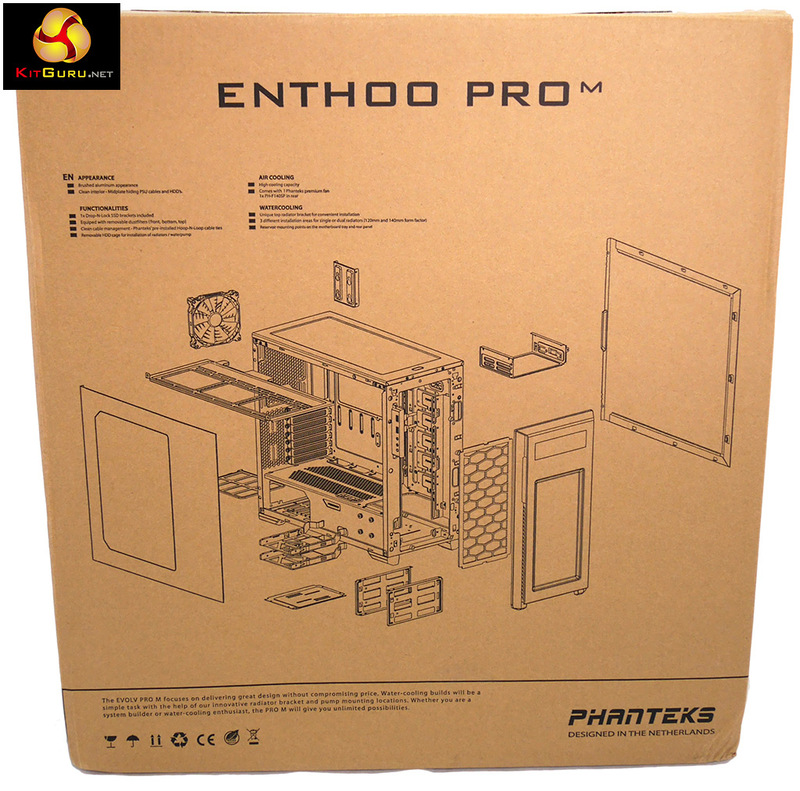 We like the Phanteks Enthoo Pro-M and admire the way Phanteks has kept the price so low. On the downside the side panels and window are nothing special. They are certainly adequate for a £60 case but might not meet the approval of the enthusiast market. Perhaps the biggest question mark over the design of the Pro-M is that the likeliest customer is the home builder who wants a good deal and we doubt they will use the facility to build a custom cooling loop. It seems likely to us that most people using a Pro-M will simply install a motherboard, cooler, power supply and drive which makes perfect sense but also misses a trick or two. Buy from Overclockers UK for £59.99 inc vat. 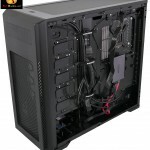 Ability to add cooling galore, including a custom loop. Full height dust filter at the front. Dust filter for PSU intake. Sliding mount for top liquid cooler. Hook and loop cable management straps. Cable grommets are well located. Side panels are flexy and rather basic. 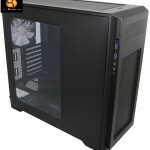 Smaller window than Evolv ATX. 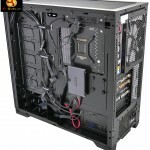 Bare minimum of drive bays to keep costs low. 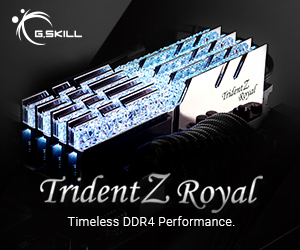 We doubt many Pro-M customers will make use of the advanced options for cooling. 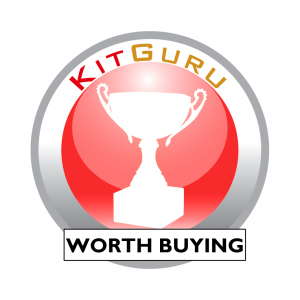 KitGuru says: Good work Phanteks. 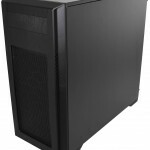 We need more budget PC cases to show you don’t have to spend a fortune to get quality hardware.